The Temporary Food Service Permit application must be submitted online at least two weeks prior to the event date. To apply for a Temporary Food Service Permit, you must have UWNetID. If you do not have one, please identify a sponsoring department, complete the appropriate form, and submit a permit application for each food vendor. Not sure whether you need a Temporary Food Service Permit for your event? Read the information below and follow the decision tree to determine whether you need a permit. Registered student organizations provide non-perishable foods (e.g., chips, dips, restaurant pizza, cake, pie and store-bought ice cream) for meetings of their own members. The food served at an event is provided by UW Housing & Food Services. Non-UW groups hold private, invitation-only events (e.g., weddings) on UW property, where the campus community is not invited. The food will be prepared at home. The food establishment is not in compliance with local health department regulations. The permit application is submitted less than two weeks prior to the event. Please click on the link below to submit an application. If you are hosting an event that is open to the public on UW property, please follow these food safety tips for safe food preparation, handling and transport. What is a temporary food service event? 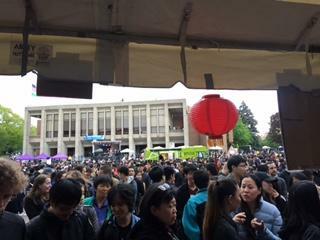 It is an event during which food is served to the public at a fixed UW campus location and is directly related to a single occasion or celebration. Is a permit required to operate a temporary food service event? Yes. A permit is needed for serving food or refreshments on University property in association with public meetings, social gatherings and special events, regardless of whether the food is being sold for profit or provided at no charge. There are some exceptions; please see the Temporary Food Service Permit Decision Tree to determine if your event requires a permit. The permit acknowledges that vendors agree to meet the requirements designed to ensure food is handled safely and is prepared under sanitary conditions according to the Washington State Retail Food Code. How do I know if I need a permit or not? Please see the Temporary Food Service Permit Decision Tree to determine if your event requires a permit. What do I do if my temporary food permit is denied? Temporary food permit (TFP) applications may be denied by Environmental Health and Safety if the outside food vendor does not meet necessary food safety requirements to serve on UW campus. These evaluations are based on recent food safety inspection scores from the local jurisdictional health department. In some instances, food establishments that were approved for a permit in the past by EH&S may not be approved at the current time. As health inspections for food establishments are performed several times each year, the ability for a caterer to meet UW safety requirements may change depending upon how they recently scored with the local public health department. Departments may hold potlucks for faculty and staff members that are not open to the public, and classmates may share home-prepared foods with each other. Serving home-prepared foods at a temporary food service event is prohibited. Do food vendors need a King County health department food permit? We accept permits from any county health department, as long as the restaurant has documented proof that it meets the county’s food safety requirements. .
Must all foods that require cooling be done at an approved or permitted kitchen? Can a faculty or staff member serve home-prepared food on campus? It depends on whether the event is open to the public or not. If it is open to the public, it requires a permit and home-prepared food may not be served. If it is a closed group or private event, it doesn’t require a permit and home-prepared food may be served. I have a business license and a health department permit. Can I serve food on campus? You need to have a sponsoring UW unit to apply for a temporary food service permit that will allow you to serve food at a campus event. Will only food items listed in the application be approved to serve? Yes; approval for any changes must be requested before the event. Do I need a food worker card to serve food? Yes; all persons who handle perishable, non-packaged foods must have a food worker card. For more information, please visit the Seattle-King County Health Department food worker website. How do I obtain a temporary food service permit? To obtain a permit, submit an application at least two weeks prior to the event. Click here to complete the application. If the food I am serving at an event is prepared by an outside vendor or caterer, do I need to apply for a Temporary Food Service permit? If the only food I am serving at an event is prepared by a UW Housing & Food Services food vendor, do I need to apply for a Temporary Food Service permit? If the only food I am serving at an event is pre-packaged non-perishable foods from a commercial retail store, do I need to apply for a Temporary Food Service permit? A Washington state food worker card is required. The authorized online training program is found online at www.foodworkercard.wa.gov. Washington Administrative Code Chapter 246-215 WAC provides the safety standards for food served or sold to the public in Washington State. Perishable foods are those likely to spoil, decay or become unsafe to consume if not kept refrigerated at 40 F° or below or frozen at 0 F°.